Working close to the countryside means that it is possible to get out and do a quick bike ride at lunchtime. 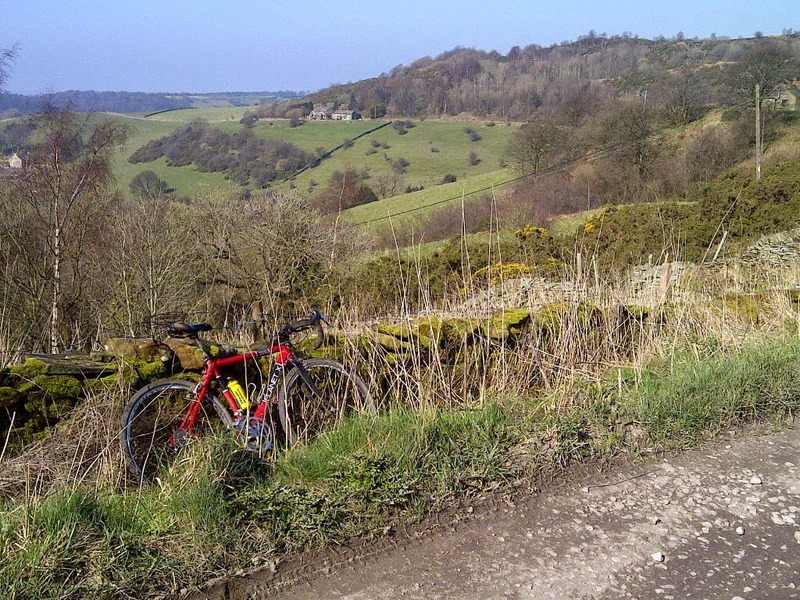 I have a couple of regular loops that I do on my road bike around Pott Shrigley or Blaze Hill. Now that it is the cyclo cross season I like to try out some off-road circuits. I must admit that it is not so easy to find bridleways in this area. There are plenty of footpaths, but we all know it's naughty to take your bike along those! I have managed to find a quick loop that I can do, and this is what I did on my lunch hour. Although it is not 100% off road, there is enough to do which will give you a good work-out and test you bike handling. There is a section behind Blaze Hill called Oakenbank, where the tarmac abruptly gives way to a pot-holed trail. It's all the more challenging as you carry on uphill for a good mile before negotiating a tricky descent. A sharp left at the bottom takes you up a very steep incline, Kiskhill, for which you'd be thankful that you are on tarmac! Once again the road turns to a messy challenging trail as it levels off, and you reach a trail that leads you back to Blaze Hill and to an area called Hedge Row, close to Bollington. If there's more time and you want an extra work-out, en-route back to the office there is a steep, cobbled road known as Beeston Brow that you can scale for good measure. Although not officially a trail, it is like riding up the Koppenberg in Belgium. I am quite happy to be on my cyclo cross bike for that rather than a road bike! So at the moment I am making the most of the dry conditions and riding my cyclo cross bike at lunchtimes before the weather changes and I become a muddy mess.